Simon & Schuster, 2015. Hardcover, 528 pages. Ernest Lawrence may be less known than Robert Oppenheimer, but both had equally important roles in the creation of the Atomic Bomb. In fact, after reading this book, one sees how if not for Lawrence’s pre-war visions the Manhattan Project may not have succeeded. Lawrence was a brilliant and driven scientist who established the Rad Lab at UC Berkley in the 1930s. He pioneered a device called the cyclotron, a spiral shaped particle accelerator, which set him on his path to fame. With that fame came the growth of his beloved lab and he trained many of the atomic scientists who would serve on the Manhattan Project, including Oppenheimer. Those he trained may have been his students or those he brought to Berkley as instructors or professors to further his projects. Lawrence was also the first to realize the sciences and engineering could work together to further goals, as he was not only unafraid to have non-physicists on his team, but he encouraged it. Besides the many physicists in the Rad Lab, he recruited chemists, engineers, and medical doctors to help with the experiments. Besides manpower to further his projects, Lawrence constantly sought funding from multiple sources to support the costly projects. He also became the first scientific manager as he had many of his students and staff working on his ideas and projects in addition to their own. When Europe went to war, in the United States there were fears that the Germans had the atomic research background to create the then theoretical atomic bomb. This led to the first plans for conducting this critical research in the States, long before it was involved in the war. Lawrence not only advocated for the research, he lent his Rad Lab to the cause and helped design the facilities at Oak Ridge where the uranium was produced. It was Lawrence who suggested Oppenheimer to be in charge at Los Alamos. He worked tirelessly to further the atomic research. Also detailed in this section were the scientists’ thoughts on the use of the bomb on Japan both before and after the bombs were dropped. In the final few chapters, the development of atomic research after World War II were discussed, with a focus on Lawrence’s projects. This included detailing the many commissions on the related research; the effect of the Red Scare on atomic research; post-war research, including the hydrogen bomb and nuclear missiles; his new Livermore atomic research facility and its competition with Los Alamos; and post-war research funding. Lawrence was often overworked in these years more so than before. 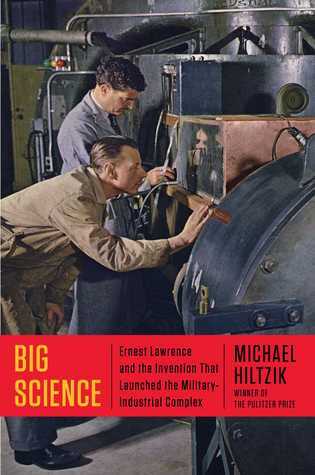 While the main focus of this book was on Lawrence and the Big Science he created, the many other key players were also detailed to varying extents. Included were Oppenheimer, John Lawrence (Ernest’s brother and a medical doctor on the team; he pioneers radiation therapy for cancer treatment), Luis Alvarez, Milton Stanley Livingston, General Leslie Groves, Robert Serber, Don Cooksey, Edwin McMillian, Vannevar Bush, Alfred Loomis, Edward Teller, and many more. While most were scientist on his team, others were scientists elsewhere he worked with on national committees after the war. Also there was a great focus on the science involved. While it was explained well in the text, it would be helpful for readers to have a basic familiarity with physics to fully comprehend it. Thankfully, I took physics in both high school and college and my dad also taught it at both levels! Overall, I learned a great deal from Big Science. I never realized the full extent of Lawrence’s role before now. Nor did I realize just how much the pre-war research affected the Manhattan Project or the era that followed. Too many other titles and documentaries make readers/viewers think it all began with World War II. Running comparisons to other books, Lawrence is mentioned in the older children/teen award-winner Bomb: The Race to Build—and Steal—the World’s Most Dangerous Weapon by Steve Sheinkin (my short review on Goodreads). That book provides a wonderful overview of the Manhattan Project and the related security issues for any age group. While I have not read it yet (I own a copy in my to-read pile), it was Lawrence’s vision that led to the creation of Oak Ridge in the popular Girls of Atomic City: The Untold Story of the Women Who Helped Win World War II by Denise Kiernan. Plus there are many books that tell the story of the Atomic era from Oppenheimer’s perspective. Looking at the industrialization efforts covered in Big Science, it reminded me of the efforts of Edsel Ford in The Arsenal of Democracy by A.J. Baime, a work with a strong focus on the creation of the Willow Run B-24 plant, which I recently read (review forthcoming). Big Science was released on July 7, 2015. I was offered the opportunity to review this title by FSB Associates. Do you have any other titles on the Manhattan Project, atomic research, or physics worth sharing? Please comment if you do! Also, do you think you will read this new perspective on the research behind the Manhattan Project?